The Salton Sea has been a story of boom to bust that directly parallels the story of the environment here. California's largest lake is surrounded by desert in the Imperial Valley. The Salton Sea is also one of the largest inland seas in the world, covering about 375 square miles, and one of the lowest points on earth at 227 feet below sea level. It was formed by accident from 1905 to 1907 when the Colorado River burst at its seams and flooded the low-lying plain. The Sea has virtually no outlflow and is fed by rivers that wind through the farming communities of the valley. The result was in the 1970's the water developed a remarkably high saline content, approaching 4.4%. The only fish that can thrive in that environment are tilapia. Dried salt covers the shoreline and everything near. Floods are common. Just 40 miles south of Palm Springs, the area became known as the Salton Rivera and was a playground for celebrities in the 1950's and '60's. Jerry Lewis and the Marx brothers were regulars. Yacht clubs, beaches and vacation homes were developed. Sonny Bono learned to water ski here and National Wildlife Refuge properties on the lake bear his name. Today, things are a little different. 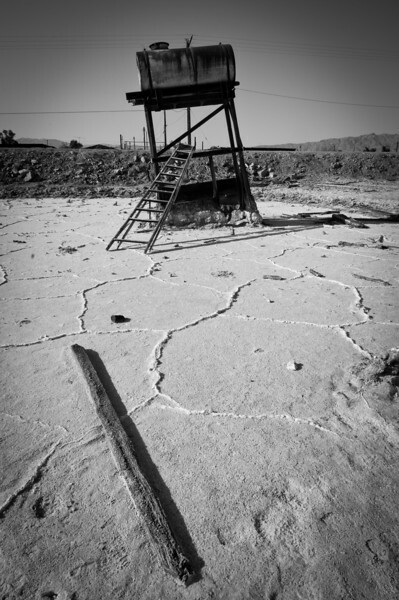 The communities around the Salton Sea are littered with abandoned buildings. Some have been flooded and all show the amazing effects of water, salt, neglect and time.The Salton Sea is truly one of the strangest places I have ever been. The water is a color difficult to compare to anything else. The salt fringed shore gives things an otherworldly look. People continue to live here and it is common to see a well-kept trailer with a car and a dune buggy in the drive circled in chain link fence and all the neighboring properties are abandoned, torn apart and covered in graffiti.